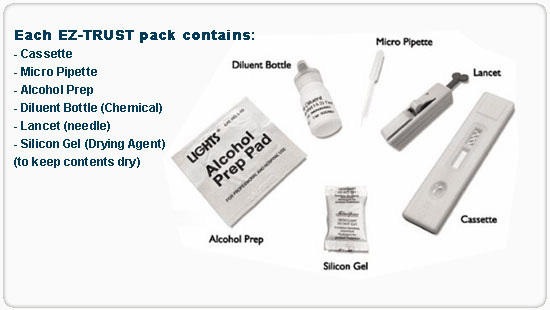 How To Use EZ-TRUST HIV Home Test Kit? EZ-TRUST HIV Home Test Kit is an easy to use product which does not require any other devices or external equipments. Just follow the step-by-step demonstrated and remember to read the important notes below. Manual is also be supplied in the real kit itself. 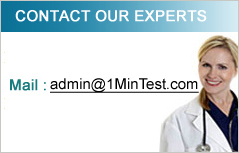 When performing the HIV test, the steps must be followed closely Use within 10 minutes after opening. Please note that the HIV Test Kit is an aid only to identify individual at this point of time. Doctors advise that the typical period of time between first contact and a positive test indication is about 90 days. Meaning test once now and again in 90 days time. Few tests can be done during the period to get a more accurate result. Do not use HIV Test Kit beyond the specified expiry date. 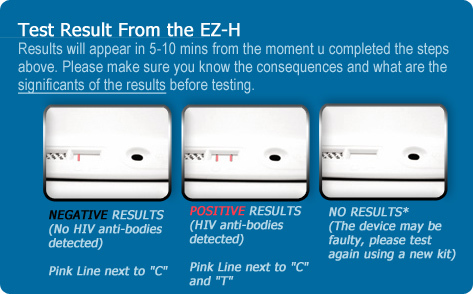 When performing the EZ-TRUST HIV Home Test Kit, the steps involved must be followed closely, If there has been a possible exposure to infected blood, and the person tested negative for HIV, the test must be repeated in 90 days. It is imperative that a positive HIV test result be followed by a Western Blot or PCR test performed by a doctor or clinic to confirm if you are indeed HIV positive. Since NO test, nor test kit is infallible, it is best to confirm test results by using a licensed medical testing facility. For one time usage only.